Back in 2008, Salman Kahn learned that his 12-year-old cousin, Nadia, was struggling with math and that she had switched to a slower class. All that Kahn, an MIT graduate and hedge-fund analyst, wanted to do was was to help Nadia develop her math skills. As Kahn tells The New York Times, before he knew it, many other family members were requesting his tutoring. So Kahn created a website and eventually started making videos and tutorials for YouTube. Soon, his videos were attracting tens of thousands of viewers each month. The following year, Kahn left his job to work full-time on developing the Kahn Academy. He caught the attention of Bill Gates, who used the site to help his own kids, and Gates eventually became a financial supporter. Now, Khan Academy has over 10 million users worldwide and offers more than 5,000 free online courses in science, technology, engineering and math. Khan says the site helps to evaluate where a student’s math skills currently are, then helps them to move at the right pace until they are ready to move to the next level. “We’re more like a highly enriched, personalized textbook, a tool for you on your own or your teacher or tutor,” Khan explains. Last year, San Jose State University considered using an online Harvard course put on by Professor Michael Sandel for an undergraduate class, but Khan thinks that’s not the best way to take advantage of technology. Khan explains, “The single most valuable thing that any student at San Jose State could have is a conversation with their professor. He or she doesn’t need to watch Michael Sandel having a Socratic dialogue with Harvard students.” Khan has removed tutorials that were incorrect in the past, but he says that is a benefit of having so many viewers who provide valuable feedback. As for Nadia, she made it through math and went on to major in pre-med and writing at Sarah Lawrence. Good for You, Nadia! And Good for You, Salman Khan! 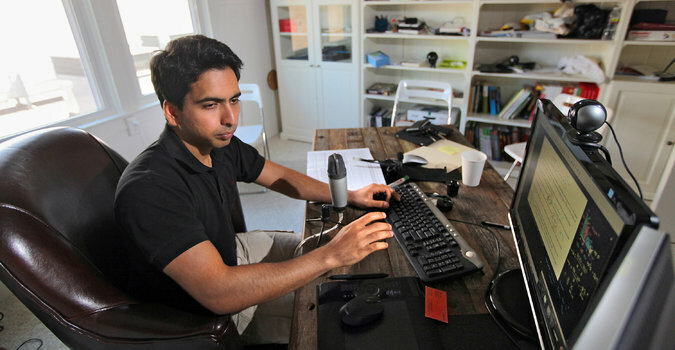 If you’ve been helped by the Khan Academy, share your story with us. For more on Khan Academy, see our previous coverage on the topic (from when it was featured on 60 Minutes), here: Khan Academy: The future of education?